Richard Segalman was born in Coney Island, New York in 1934, and the timeless American-ness of his iconic birthplace — think amusement parks and seaside relaxation — seems to echo the timelessness one feels when looking at his work in any medium. Today, Segalman lives in Woodstock, New York, a perhaps even more quintessentially American locale. 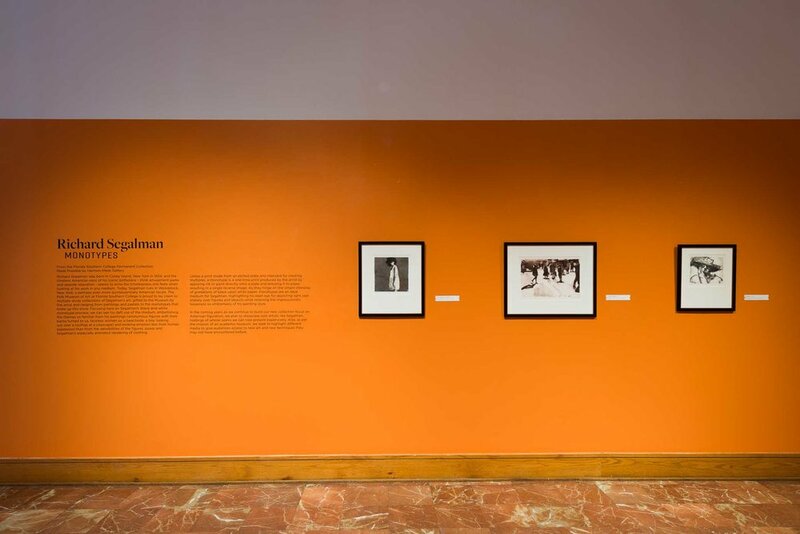 The Polk Museum of Art at Florida Southern College is proud to lay claim to multiple study collections of Segalman’s art, gifted to the Museum by the artist and ranging from paintings and pastels to the twenty-four monotypes that make up this show. Focusing here on Segalman’s black-and-white monotype process, we can see his deft use of the medium, embellishing the themes so familiar from his paintings (anonymous figures with their backs turned to us, faceless women on a beachside, a boy looking out over a rooftop at a cityscape) and evoking emotion less from human expression than from the sensibilities of the figures’ poses and Segalman’s especially animated rendering of clothing. Unlike a print made from an etched plate and intended for creating multiples, a monotype is a one-time print produced by the artist by applying ink or paint directly onto a plate and pressing it to paper, resulting in a single reverse image. As they hinge on the simple interplay of gradations of black upon white paper, monotypes are an ideal medium for Segalman, highlighting his keen eye for depicting light cast sharply over figures and objects while retaining the impressionistic looseness so emblematic of his painting style. In the coming years as we continue to build our new collection focus on American figuration, we plan to showcase solo artists like Segalman, holdings of whose works we can now present expansively. Also, as per the mission of an academic museum, we seek to highlight different media to give audiences access to new art and new techniques they may not have encountered before.